Coconut oil has gotten some pretty incredible claims associated with it lately. Kinda like New Year’s Eve – supposed to be magic, but in reality, not all that great, and rather overpriced. It will not treat your dog’s parvo. It will not cure your cat’s cancer. It is not a substitute for medical care. No, coconut oil isn’t terrible. There is a niche of animals that truly can benefit from coconut oil!! For the majority of problems, however, there are much better options out there. Unfortunately, the majority of pets I treat are overweight or obese, making me reluctant to suggest a supplement that adds a significant amount of fat and calories. I don’t know why coconut oil seems to be getting credit for things it can’t do. It must have a really good agent. First thing we need to learn is which kinds of fats are beneficial. Poly-Unsaturated Fatty Acids, or PUFA’s have been popular among both physicians and veterinarians for years. The fatty acids that vets often recommend are Omega 3 and Omega 6 fatty acids, and these are both types of PUFA’s. An example of an Omega 6 fatty acid is linoleic acid. This is considered an essential nutrient for dogs and cats, as their bodies are unable to synthesize it. However, the good news is that the typical diet fed to dogs or cats is high in omega 6 fatty acids, so we really don’t have to worry about supplementing those. Omega-6 fatty acids are found in corn oil, safflower oil, sunflower oil, palm oil, sesame oil, olive oil, and canola oil, to name a few. The Omega 3 fatty acids we vets often recommend are DHA and EPA. These have been demonstrated in many studies across the globe to help with cardiovascular disease, arthritis, skin inflammation, kidney disease, and even brain function. They are often found in fish oil, and a related PUFA, called ALA, can be in flax seed oil as well. Veterinarians have been recommending Omega 3 fatty acids in pets for years. Several studies over the past 15 years have documented proven benefits of Omega 3 fatty acids! Sure, more are always needed, but safety and benefits have been well established. OK, so let’s get some Omega-3 fatty acids! Since the internet seems to think coconut oil can treat so many diseases, it must have lots of Omega 3 fatty acids, right? Three kinds of fats people give to pets. Nope. Coconut oil is 0% omega 3. Zilch. Nada. So that’s a bummer. How about omega 6 fatty acids? Well, coconut oil is 2% Linoleic acid, which is an omega 6 fatty acid. That’s kinda lame. What on earth IS in coconut oil then? Coconut oil contains MCT’s – Medium Chain Triglycerides. What do these do? They do not share any characteristics of PUFA’s, unfortunately. They are in a separate class altogether. The main good thing MCT’s can do is be rapidly absorbed by the intestines. So if you have an emaciated or starved animal and want to get some calories into it, then MCT’s would be a good option. The medical indication for MCT supplementation is in animals with a specific intestinal disease (diagnosed from intestinal biopsy most often) that makes it difficult for them to absorb fat. Since the MCT’s are so well absorbed by the intestine, they are a good option for a fat that will actually get into the animal. Coconut oil is VERY high in calorie, and if fed on a regular basis, will cause weight gain if calories are not cut elsewhere. However, if you’re using it to treat an underfed or underweight animal, then this is less of a concern. So yes, coconut oil has a valid use, and an important one! Thing is, most people’s pets are not underweight, malnourished, or have intestinal disease. In fact, most pets are overweight, and the additional fat and calories from coconut oil just makes the problem worse. 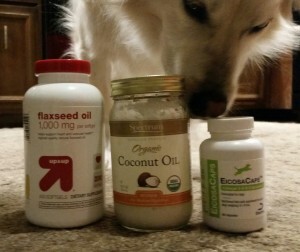 The bad news – coconut oil can also irritate the pancreas in some pets! Portions must be controlled and accurately measured. 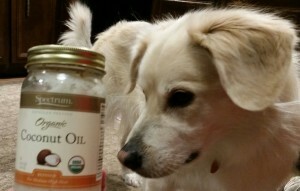 If a pet is prone to pancreatitis, I would never consider giving it coconut oil! This goes for all miniature schnauzers as well. That breed is the poster child for pancreatitis, so don’t chance it. In cats, coconut oil dosed inappropriately can cause fatty liver disease. Coconut oil can also cause flatulence, bloating, and diarrhea if given in larger-than- needed quantities. And a little goes a long way! This is not something to just feed your pet willy nilly! Reggie models the coconut oil. It’s even organic! OK, so maybe feeding coconut oil to your (healthy or overweight) pet isn’t really all that great. How about using it topically (rubbing it on their skin)? Currently, there are no well designed published studies touting the effects of coconut oil as a topical moisturizer, anti-bacterial, what have you. That’s not to say it’s BAD for your pet. It is greasy, and I personally wouldn’t want to slather my dog and then have him climb into bed with me. Maybe I’m just a diva. Some veterinarians who practice Traditional Chinese Medicine are beginning to use coconut oil topically. These veterinarians often recommend oral fish oil (back to those omega 3’s!) for itchy skin, but have used coconut oil on the skin with some success. Other holistic veterinarians are using coconut oil orally for gastro-intestinal upset in animals who have not been diagnosed with intestinal disease (yet). The ones I talked to emphasized SMALL amounts and easing them in gradually, monitoring how well they tolerate it. For this reason, I would only suggest feeding coconut oil under the advice of a veterinarian, and one trained in Traditional Chinese medicine. So is coconut oil all bad? Not at all! There is a valid place for it, just like everything else. And yes, some holistic vets are using it and learning as they go! However, given the obesity epidemic we’re seeing in our pets, offering an oral fat supplement with questionable benefits and almost guaranteed weight gain does not make a lot of sense for the majority of animals. For an underweight animal, coconut oil could be a great addition to the diet when used correctly. Its use as a topical treatment for some skin diseases is still being explored by holistic veterinarians. Most say it is harmless when used that way, and we’re hopeful some actual well-designed studies will come out describing any proven benefits. So again, coconut oil on the skin is not bad! It’s just that, right now, better treatments are out there in terms of proven efficacy. Bottom line – Omega 3 fatty acids can do a LOT more for the average American pet than MCT’s can. So pass on the coconut oil for now and bust out some fish oil!